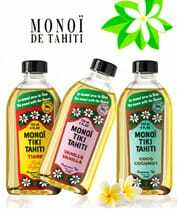 You can use monoi oil in many ways. Here we present you an idea of monoi oil hair mask, that will moisturize, nourish and smoothen your hair. The results will be visible within less than a month! 1) Get one of the monoi oil hair products e.g. from Monoi Tiki, Hei Poa or Tevi brand. 2) Choose a night that you know that the next morning you will wash your hair. Brush it gently and thoroughly before the oil application. 3) Pour a little bit of monoi oil into hands and rub it into palms. A beautiful Tahitian flower scent will fulfill the space around you. Use sparingly, you can always apply more if needed. Hair should NOT be dripping with oil. It is just enough when it looks a bit greasy. 4) Separate a handful of hair and start streaking the monoi oil through the hair in a downward motion. You can separate hair into about 4 handfuls around the head (or more if needed) and apply more monoi oil. 5) Concentrate a bit more onto the ends but still carefully. Excess of the oil will not bring any extra results. 6) Go to bed and use a hair covering in order not to spread the oil on your bed sheets. It shouldn’t not happen, but if you use too much oil it is better to be careful. 7) In the morning, use a gentle shampoo and clarifying and light conditioner, then style as usual. We advise using a monoi shampoo and conditioner! Repeat the treatment once week and the results will be visible within a month!